Welcome to the Plume Blog! 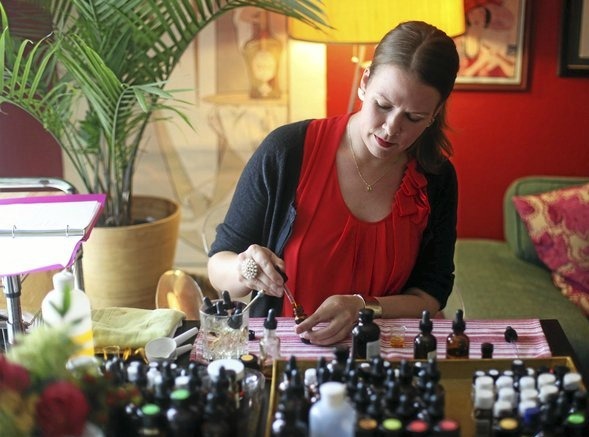 My name is Tara, and I am the Tulsa, OK-based creator and perfumer behind Plume Natural Perfumery. Plume strives to provide customers with a luxurious scent experience that is subtle and personal, free from synthetics and chemicals and enriching to the senses. As a natural perfumer and a devotee of art and history, I value beauty that is inspired by the past. The perfumes I create merge my interest in lost art forms together with my love of scent and fascination with its ability to uplift moods, seduce, and inspire. I hand-blend 100% natural fragrances using traditional European perfumery techniques, and all of my perfumes are infused with a swoon-worthy blend of pure organic and botanical essences. In addition to being the owner and perfumer at Plume, I’m also Ph.D. candidate, specializing in the literature and culture of the late 19th century. My other passions include: Art Nouveau, decadent literature (Oscar Wilde, Swinburne, and Huysmans are a few favorites), vintage magazines, Oklahoma thunderstorms, my adorable pug Gidget, blogging, and volunteering at our local art museum. The aim of this blog is to share my passions and creations, as well as to inspire, entertain and help you enjoy a more naturally fragrant life! For more information, visit my mission statement post here. Want to ask a question or chat? Feel free to email me at: plumeperfume@gmail.com. Hi! My name is Tara, and I am a natural perfumer and PhD candidate in Victorian literature. This blog is a record of my adventures as an aromatic artist, small business owner, and seeker of aesthetic delight. I hope you enjoy your stay! Click the logo to sign up for the Plume Newsletter!